Some endpoints in the GitHub API require authorization to access private details. For example, if you want to get all of a user’s repositories, you’ll need to authenticate to see private repositories. If you’re building a third-party application that integrates with the GitHub API, it’s poor form to ask for a user’s GitHub credentials. Most users would be wary of providing that information. 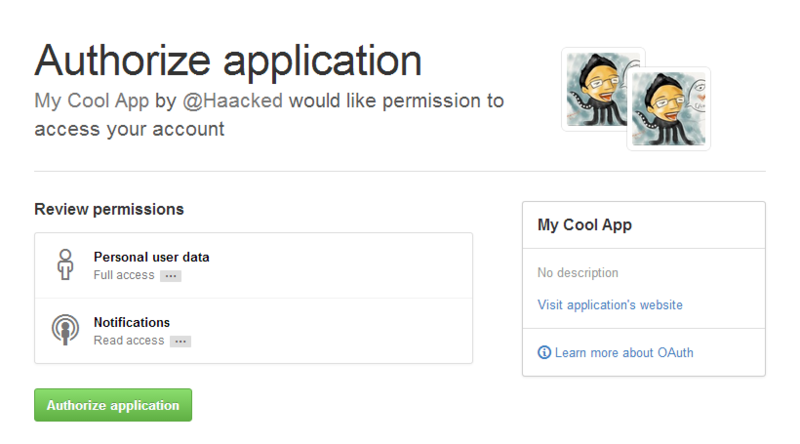 Fortunately, Github supports the OAuth web application flow. This allows your app to authenticate with GitHub without ever having access to a user’s GitHub credentials. In this post, I’ll show the basics of implementing this workflow using Octokit.NET. The basic worfklow of an OAuth flow is as follows. On an unauthenticated request to your site, your site redirects the user to the GitHub oauth login URL (hosted on github.com) with some information in the query string such as your application’s identity and the list of scopes (permissions) your application requests. The GitHub Oauth login page then prompts the user to either accept or reject this authentication request. If the user is not already logged into GitHub.com, they’ll login first. If the user clicks “Authorize application”, then this page redirects back to your site with a special session code. Your site will then make a server to server request and exchange that session code and your application’s client secret for an OAuth Access Token. You can then use that token with Octokit.net to make other API requests. 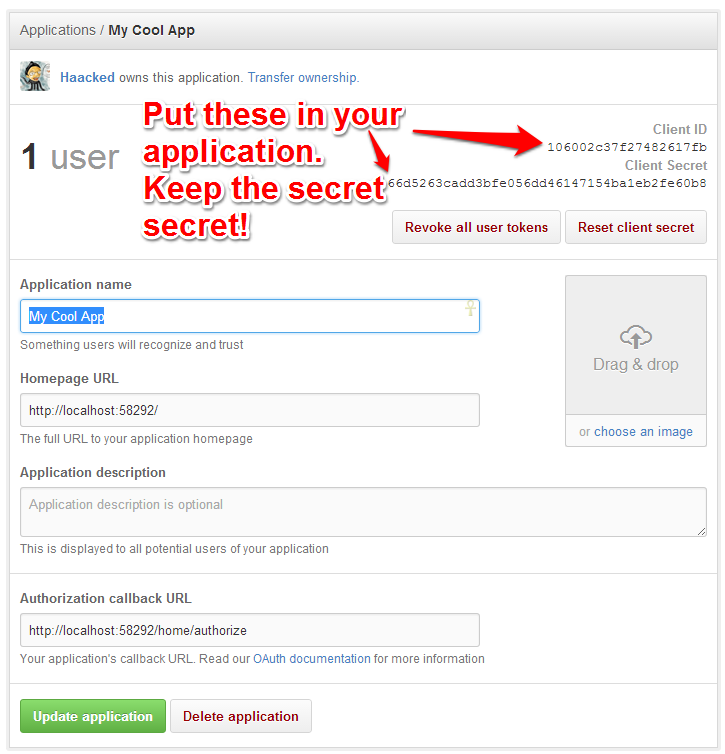 Before any of this will work, you’ll need to register your application on GitHub.com to get your application’s client secret. Never share this secret with anyone else! While logged in, go to your account settings and click the Applications tab. Then click “Register new application”. Or you can just navigate to https://github.com/settings/applications/new. Here’s where you can fill in some details about your application. After you click “Register application”, you’ll see your client id and client secret. I’ve put together a simple raw ASP.NET MVC demonstration of this workflow to illustrate how the workflow works. In a real ASP.NET MVC application, I would probably implement Owin middleware (which has been done before and I link to it later). In an older ASP.NET MVC application I might implement a custom AuthorizeAttribute. Here’s the code for the HomeController. I tried to make it easy to follow along. // application at https://github.com/settings/applications/new to get these values. // repositories which include public and private repositories. // without ever having the user's OAuth credentials. // requires that the user be logged in to work. 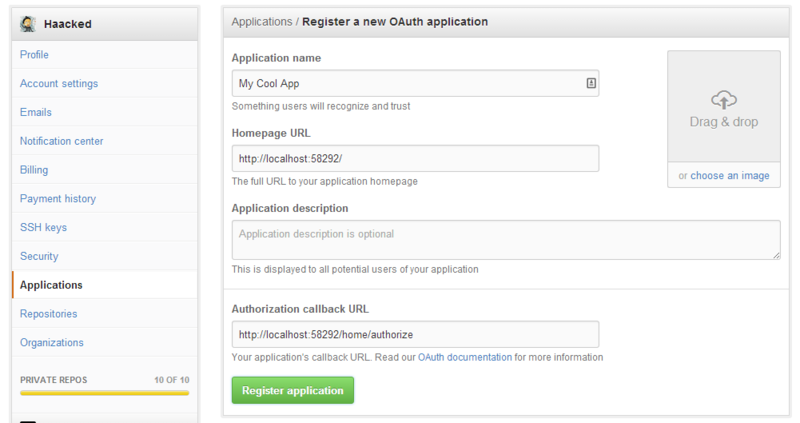 // This is the Callback URL that the GitHub OAuth Login page will redirect back to. 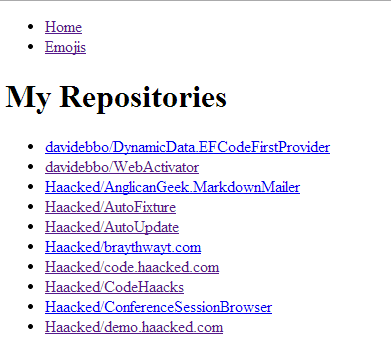 If you visit the /Home/Emojis endpoint, you’ll see it works fine without authentication since GitHub doesn’t require authentication in order to see the emojis. But visiting /Home/Index requires authentication. That redirects to GitHub.com. GitHub.com in turn redirects back to /Home/authorize which stores the OAuth access token in the session. In a real application I might store this in an encrypted cookie or the database. To get this sample working, make sure to replace the clientId and clientSecret constants with the values you got from registering your own application. When you visit the home page and authorize the application, you’ll see a list of your repositories lovingly rendered by my beautiful web design. If you’re using ASP.NET MVC 5 or any OWIN based application, there’s an Owin OAuth provider for GitHub you can use instead to provide authentication. I haven’t played with it so I have no idea how good it is or how you obtain the OAuth Access Token when you use it in order to pass it to Octokit.net. but did not work... what's wrong? Is it required to login (use auth) to get public repositories? I would like to get a public repo by link given by user and get, for example, .c or .cpp files in that repo. Is this possible without auth? Are there more examples on Octokit .NET or some kind of API documentation? Or some community forum where I can read more? Can i use this Octokit package in ASP.NET Web forms? I want to enable OAuth in native app, how do I go about it ? Can you do this for native application like ASP.NET Console Application? The console application doesn't has the URL and Redirect URL? Can u help me with this? Thanks!